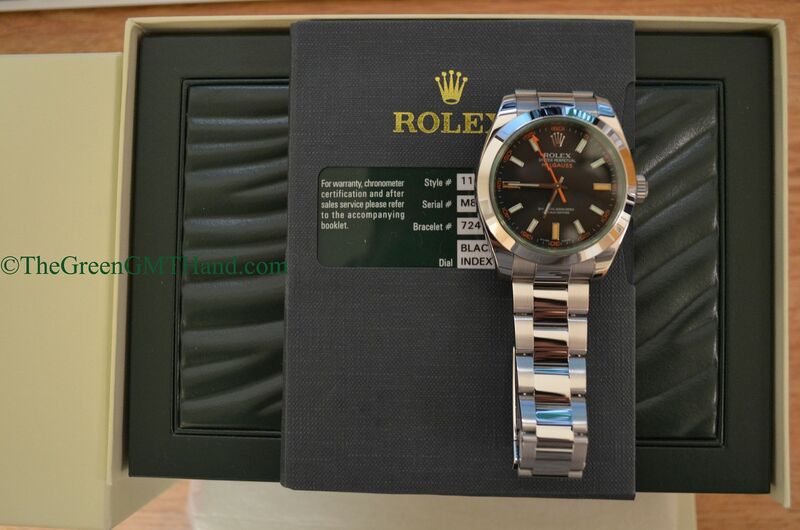 This Rolex 116400 Milgauss GV green crystal is another one of our favorite Rolex models. 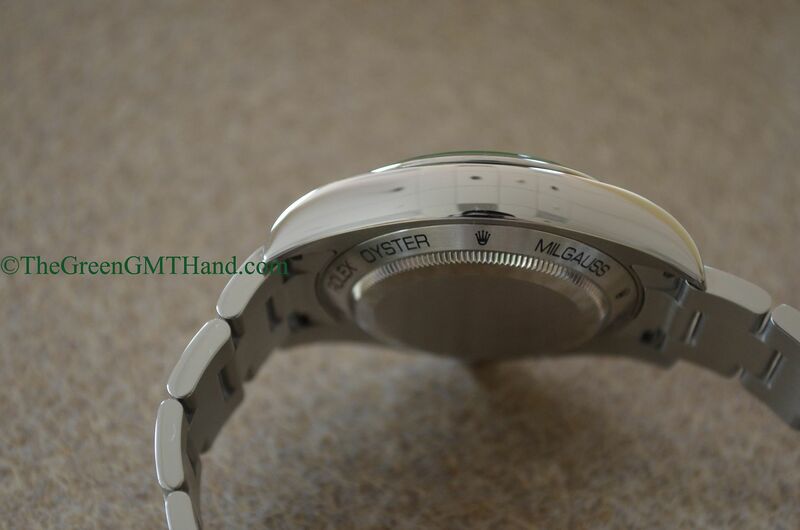 The M serial seen here is the first serial issue of this reboot of the Milgauss lineup, which had been discontinued for a number of years due to poor sales. Ironically, the vintage Milgauss models that had sold so poorly (they had been marketed as the scientist’s watch for its antimagnetic abilities) now command high premiums at auction for the most well preserved and complete samples. 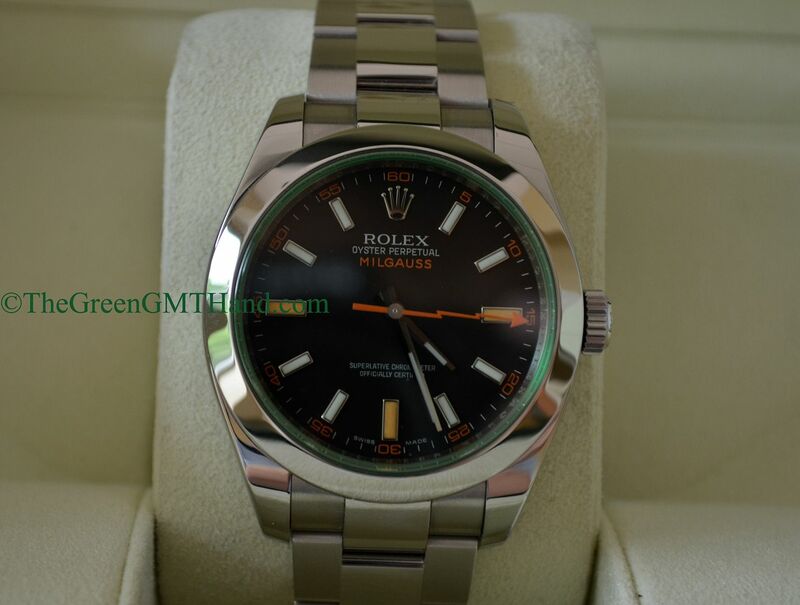 You routinely see nice samples of the Rolex 1019 vintage Milgauss for $25,000 plus. 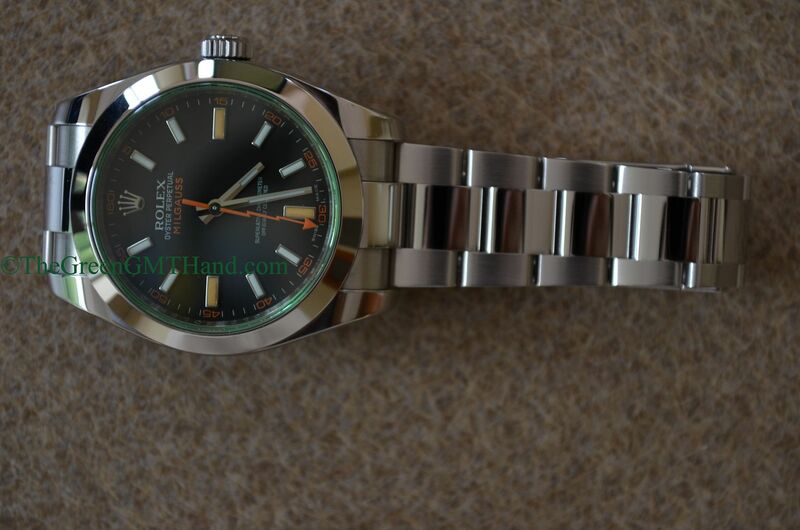 This Milgauss 116400 features the distinctive green crystal that separates it from the two less expensive black and white dial Milgauss models. There is now also a blue dial available with green crystal. The green crystal model is about $500-$600 more expensive, slightly more for the blue because it is a newer model. 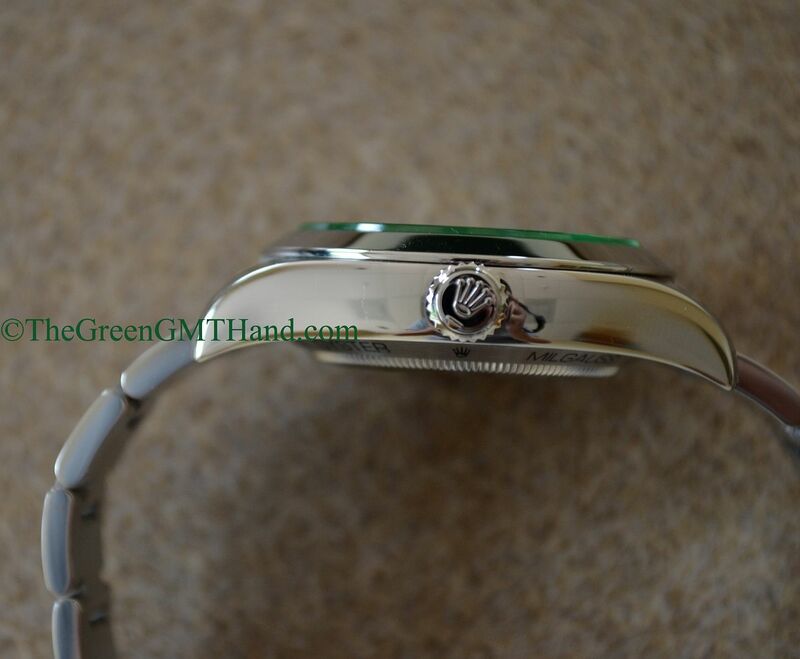 It was rumored that Rolex experienced setbacks attempting to making the crystal green and maintaining the structural integrity at the same time. The 3131 movement inside is an upgraded 3130 movement with blue parahchrom hairspring and a movement escapement made out of antimagnetic alloy. 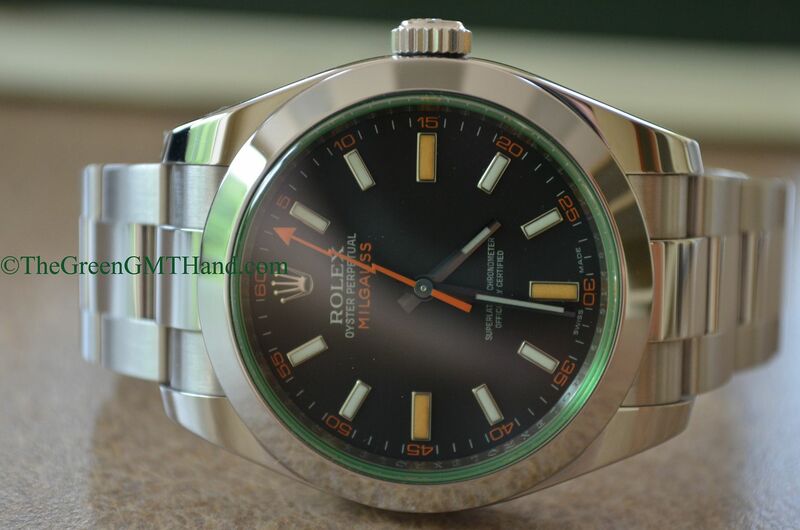 The case diameter for the Rolex 116400 GV Milgauss is 40mm, but its thickness makes it very unique. Underneath the caseback is a “Faraday Cage” to allow for resistance to magnetism, a feature originally developed for European scientists working at CERN (they were constantly exposed to magnetism at work). The dial is perhaps the most unique professional line dial. 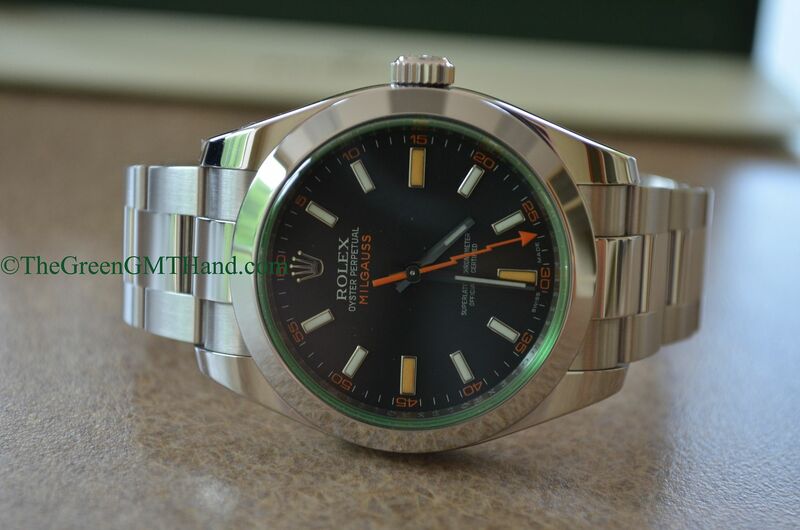 It features a striking orange thunderbolt hand to match the orange writing “Milgauss” on the dial. Lume on the 3, 6, and 9 markers is blue chromalight while the rest of the lume is green luminova. This pattern creates a mix lume effect when the lights are off, very mesmerizing to look at. The thunderbolt hand has no lume and therefore does not glow. 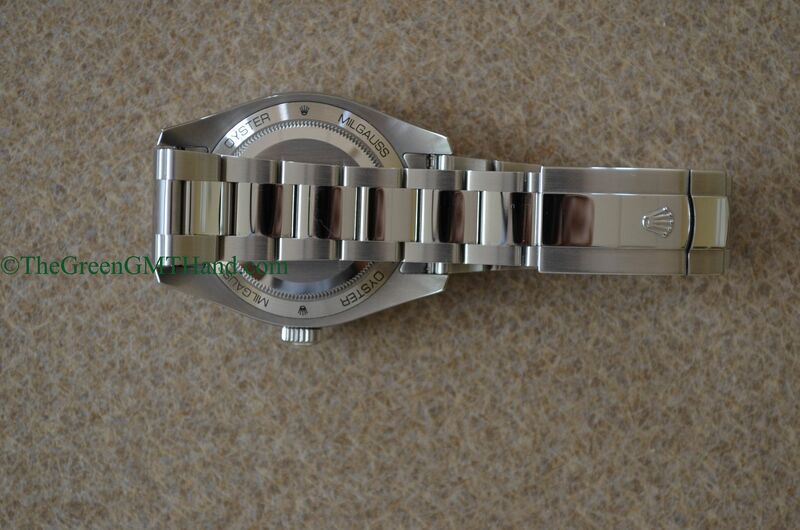 The bracelet is a 72400 reference with solid middle links and polished finish, surrounded by brushed outer links. 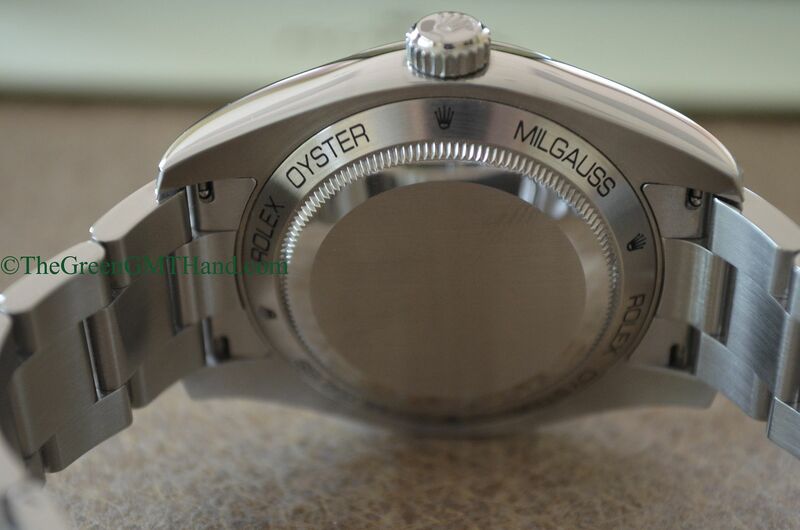 The entire head of the Milgauss is polished, included the polished smooth bezel. 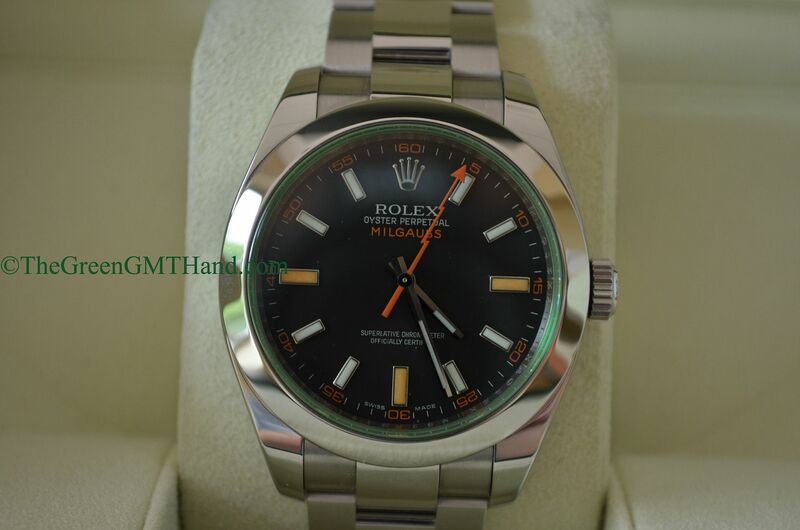 The green crystal does not feature the laser etched crown found on other Rolex crystals manufactured after 2001/2002. 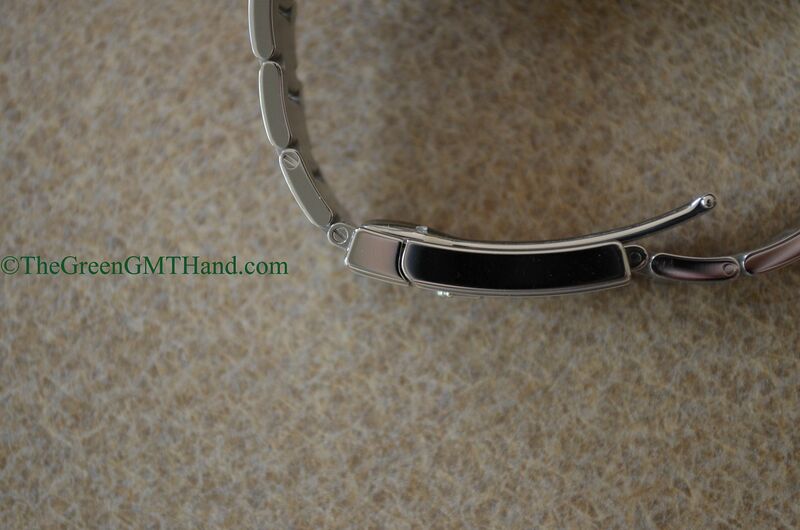 The 72400 bracelet also contains an easy link comfort adjustment link within the clasp. This M serial first issue Milgauss GV was SOLD and delivered to our buyer as a complete set with all original boxes, warranty card, and manuals.